Come Visit “The Parnassus Pen” – Jenny and Jonathan Got Married! This is Jenny, and I have a few items to discuss. First: Happy birthday to my youngest sister, O.S.G! Sis, if you are reading this, I want you to know that it was so much fun to watch you grow up! Second: Happy spring to everybody else. This blog, www.jennyandjonathangetmarried.com, is staying put. Jonathan and I will continue to blog together here about our home renovations and our family’s adventures. 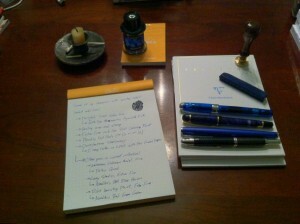 That being said, I present to you “The Parnassus Pen” at www.parnassuspen.com. “The Parnassus Pen” is my new home for my blog about Pennsylvania and its people, history, and lore. In Greek mythology, the muses of music and poetry lived on Mount Parnassus. Today, I live in the Parnassus neighborhood of New Kensington, Pennsylvania. Parnassus is now a part of me, since every place where I ever lived or spent large amounts of time are part of me. You see, I came to New Kensington for the first time in 2003. At that time, I knew Jonathan for a few weeks. He asked me to meet him at his newly-purchased Victorian house in Parnassus. He gave me directions from the turnpike that included warnings regarding the popular speed traps in Springdale. I showed up at Jonathan’s front door in Parnassus on a sunny December afternoon, and thus began my adventure in this neighborhood. After we got engaged, Jonathan set up www.jennyandjonathangetmarried.com as our weddding website. After our wedding, he converted this domain into a blog about our house projects. Jonathan always intended for this to be a joint blog. However, I initially had no desire to blog. So, Jonathan blogged here alone for several years before I joined him. When I finally joined Jonathan here, I had so much fun. I love this blog because Jonathan and I worked together to make it what it is. We set up “The Parnassus Pen” so that I can explore topics beyond our home and our family. I hope that you will visit me at www.parnassuspen.com.